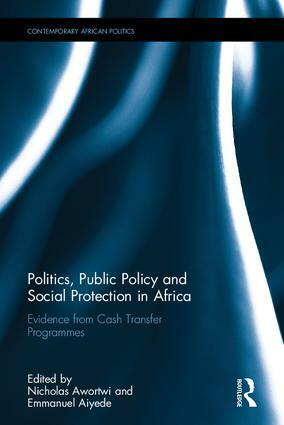 Politics, Public Policy and Social Protection in Africa reveals key answers, drawing on empirical studies of cash transfer programmes in Botswana, Ghana, Kenya, Nigeria and Uganda. Social cash transfer might be the most effective “safety net” formula to emerge so far. The country chapters in this book explore why it works and how it might be harnessed for poverty alleviation. The studies uncover the very different motives of donors, politicians and the poor themselves for making it their preferred choice; why governments are not expanding the donor-driven pilot programmes as expected, and why ruling elites are not trying to help or hinder a concept which, on the face of it, could derail one of their most lucrative gravy trains. Visit https://www.routledge.com/Politics-Public-Policy-and-Social-Protection-in-Africa-Evidence-from/Awortwi-Aiyede/p/book/9781472486523 to order a copy.